Last week Dow posted the worst week of the year by dropping 150 points to end the week at 13081. 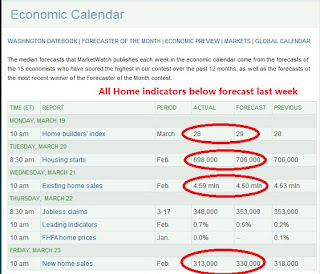 Last week, we mentioned that housing reports dominate the economical calendar and will provide the direction for the Dow. 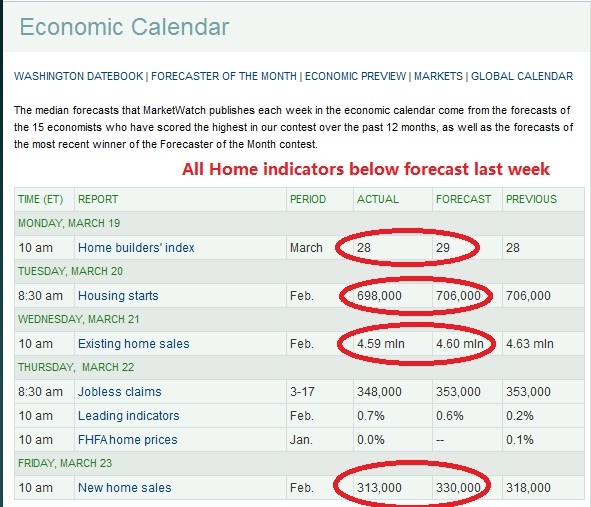 Let us look at the results from the housing reports. Almost all fell below expectations. That is the reason why Dow drops 150 points. As we begin to close out the month, this is an important week. We do not expect the Dow to move a lot ahead of next week. This week we shall take a look at some important enterprise reports. The reports you need to take note of are 1) Durable Goods report coming out on Wednesday, and 2) Chicago PMI coming out on Friday. Let us see how these 2 reports' results are. Chicago PMI will affect ISM next Monday. Together, they will determine if enterprise reports are generally good for April.